This breakdown includes the seconds! Time's robot minions that i helped paint. For this shot Time's head was completely replaced with our digi double. His head, hat, and mechanics are all CG. The Queens henchmen are made entirely out of vegetables. Some of the veggies were found at a local grocery and photographed in the store. Everything from mangos, agave, zebra tomatos, okra, and even dragon fruit were used to paint the different pieces. Here's a shot showcasing a couple of the soldier variations. There were lots of changes in color, including their arms, skirt leaves, hat leaves, and hands. A very close up shot of the binoculars. The prop makers had created a prop that was in the same vein as this piece, but the director later decided to make changes to the design so we replaced it with our CG version. Times little minions are called his seconds. In this shot I painted the one on the far right and far left. Another shot of the seconds. I was responsible for the paint work on the far right and far left robots. From left to right, I painted the third, fifth and sixth seconds. The minute was an assembled version of all the different seconds parts. Im responsible for three of the six seconds. Painted the Tweedles skin and clothing. There were three versions of these characters.. Kids, Young, and Old. Close up of the tweedles holding hands, with some detail visible on they clothing as well. Fully CG faces on the tweedles in this shot. This shot features the Young Tweedles and their striped outfits. If you look carefully you'll notice the stripes are inverted between Dee and Dum. I painted both the Bloodhound and Rabbit as well as the Rabbit's outfit in this shot. The gate to the realm of the living. It was intended to feel bright and vibrant. Greenish turquoisetarnish was painted in cracks and crevasses to give it an old realistic feel. Painted to feel dark, and moody, lots of rust and rough textures. A close up of the details on the living gate. Here is the Mad Hatter digi double frozen in "time". Dressed in his safari attire. A whimisical little set piece with personality descriptions taken straight from wonderland like.. Muchiness, Flutterwacken, Urksom, Skrivish, etc.. The chestnuts on rope in young hatters left hand were apparently a common toy for British children from the mid 1800s to 1900s. 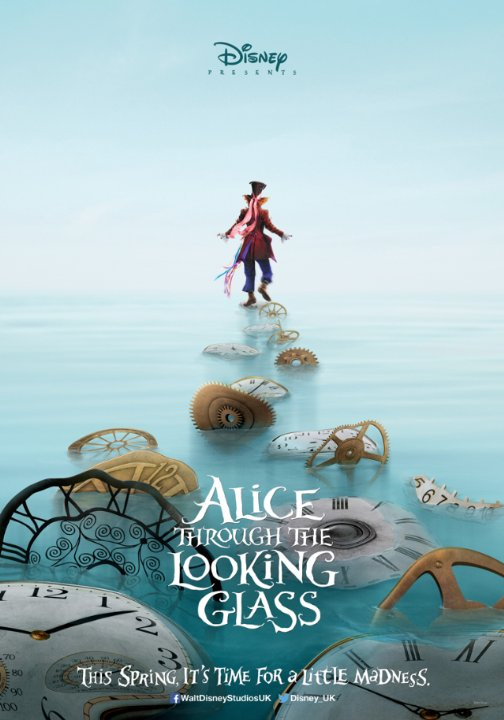 Alice Through the Looking Glass was the first show I worked on at Sony Imageworks. I was interviewed in Los Angeles and moved to Vancouver to start my SPI stint on this project. I was one of an eight person texture team and I'm happy to say thanks to that team it was one of the most fun projects I've worked on to date. My role was mostly as a character painter though I was also able to paint a handful of props and some environment pieces as well. Here is a list of some of the assets I painted. *Bloodhound Old, Young, and Kid. Started with the original maps from the first Alice, spent time updating the faces especially for close up shots, special attention was given to the nose, lips and eye areas. *The Time digidouble as well as his mechanical head. *Madhatter digidouble in his safari outfit. *White queens horse, detail motivated updates to the face and snout. *Over-sized mantle and fireplace barrier in the backwards room. All works © Reilly Lohr and respective studios. Please do not reproduce or use without the expressed written consent of Reilly Lohr.